As a long time family caregiver and professional in this field, I can tell you that the myriad of emotions that caregivers face on a daily basis is complex and ever-changing. That said, grief, guilt, and anxiety are certainly at the top of the list. How can we, as professionals in this field, better understand family needs and partner alongside them on this difficult journey? Let’s talk first about the emotions that family members experience in deciding to move their loved one into assisted living or another level of care. First, families are often focusing a tremendous amount of attention on helping their loved one cope. This can be overwhelming in itself, and certainly where the grief, guilt, and anxiety begin to kick in. Grief may be the sadness of realizing that their loved ones are aging. If there is chronic or serious illness, anticipatory grief might be the realization that death is in the foreseeable future. If a loved one is living with dementia, grief is felt over the loss of who that person once was. Families, especially primary caregivers live with guilt. I often tell caregivers this is an added benefit of the job. Often second-guessing decisions, caregivers tend to be overly sensitive to their loved one’s own emotions. At the same time, juggling family, job responsibilities, and caregiving duties can leave a person feeling like they are not doing a good job in any of those areas. When guilt piles up, it often spills to feelings of unfounded fear and doubt. Anxiety, like grief and guilt, can be caused by and can cause a snowball of other emotions. 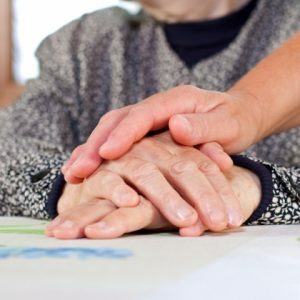 When a family member is the one “in charge” of taking care of the many tasks associated with moving their loved one to a care facility, anxiety kicks in quite easily. What often happens is that when one is under stress, rational decision making sometimes goes out the window. It’s important that as professionals we assure families that, as hard as this process is, it is normal to feel these emotions. Helping them with resources (movers, real estate professionals, support groups, etc. can ease some of the burdens and also provide a network of people who are experienced and trusted). While family members, especially primary caregivers are learning, most have not walked this path before. If there is one piece of advice that professionals need to remember it is that families know far less about the complex world of caregiving, levels of care, chronic illness, Alzheimer’s and other dementia, legal and financial planning and dealing with stress and burnout – than we expect them to! This is not to diminish the admirable responsibilities that caregivers take on. There is just so much to learn. I was years into caregiving myself before I even realized what I needed to know – and then under stress, I’d forget the things I did learn! Give them a checklist of things to do before their loved one moves. This list may include what to bring in the way of furniture, clothing and personal items. Invite them for lunch and go over the list and any concerns. This is a good time to get to know a bit more about their future resident, but also the relationships of the family. Assure the family that as difficult as this time is, it will get easier and that staff is there to ease the transition for everyone. Make sure the family feels comfortable with the staff that will be most involved in the initial move and transitioning their loved one. Knowing and discussing any questions upfront will save day-of moving confusion. Encourage the family to give their loved one a few days to settle in. They will benefit by the break, and many times it helps the new resident get acclimated to their new home. A smile goes a long way, a hug calms fears, and humor eases tension. The Art of Caregiving – Can it be Mastered? Artist and blogger Phil Davies say the reason most frustrated artist stay frustrated is that they don’t know how to practice their drawing and painting skills. Each time they draw or paint a picture, they just hope it turns out better than the last one. If we approach caregiving skills as an art, the question then is can it be mastered? Davis says art is supposed to be a rewarding hobby, when most of time one is stressing over every pencil mark and brushstroke, desperate not to make a mistake. Could it be that many artists don’t have the skills, techniques and confidence to enjoy what they are doing? Like artists, caregivers need to break down the big, difficult skills into smaller building blocks. The problem is that very few caregivers (or artists) do this. Depending on your current skill level of caregiving, whether you are a professional or family member – you want to practice with smaller building blocks first. Artists must first learn the art of color mixing. Additive mixing is used to produce a wide range of colors using only three primary colors additive mixing of colors is unintuitive as it does not correspond to the mixing of physical substances (such as paint) which would correspond to subtractive mixing. For instance, one can additively mix yellow and blue by shining yellow light together with blue light, which will result in not green but a white light. As in this example, one should always have the mixture of light in mind when considering additive color mixing as it is the only situation where it occurs. Despite being unintuitive, it is conceptually simpler than subtractive mixing. Two beams of light that are superimposed correspond to additive mixing. By convention, the three primary colors in additive mixing are red, green, and blue. In the absence of color or, when no colors are showing, the result is black. If all three primary colors are showing, the result is white. When red and green combine, the result is yellow. When red and blue combine, the result is magenta. When blue and green combine, the result is cyan. 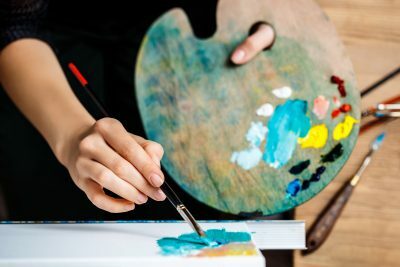 Like color mixing, caregivers blend many skills (that first must be learned) so that the outcome is a well blended hue of providing safety, security, trust and enhanced quality of life. In order to achieve this, it takes dedicated practice – understanding and accepting that mistakes will be make along the way. There are so many variables to the art of caregiving that when blended together can result in a beautiful (not perfect!) care partner relationship, healthy care receiver and empowered care giver. Like art, it’s a work in progress. Can it be mastered? I believe that caregivers can gain enormous confidence with exceptional training, continued education and the will to keep learning. Caregiving, like art, is an every changing range of color and feelings, and for that I would say our mastery is in the journey. Like artists, if this approach is practiced, it will transform quality! Pam Brandon is President/Founder of AGE-u-cate® Training Institute and a passionate advocate for older adults and those that serve them. Pam seeks to empower professional and family caregivers, faith communities and organizations in better understanding older adult and caregiver needs.